Hygiene slings are specifically designed for toileting and hygiene functions. Access is unrestricted for most users, making this sling ideal for independent transfer and toileting. 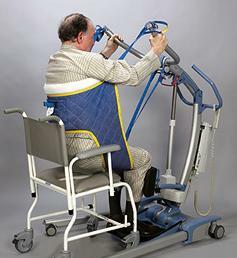 The hygiene sling is designed to be used with either a patient lifting hoist or a stand aid. It gives access to be able to remove and refit lower garments for toileting transfers whilst a client is suspended in the sling. As the client is lifted and their position becomes more extended, the ability to adjust the tension on the chest band is an important feature for the comfort and security of the client. The Hygiene Sling features quilted material and comes with leg and shoulder straps with loops for various seating positions. A wide Velcro strap or buckle across the chest provides additional upper body support. Hygiene slings come with color coded trim: SILVER for junior, RED for small, YELLOW for medium, GREEN for large, BLUE for extra-large and extra-extra-large.